Go, Granny, go! Not sure how PC this is, but we know our whisky-swilling grannies would laugh at these Racing Grannies slot cars, pitting one wheelchair-bound octogenarian against another on this 10-piece oval. Look out, you grannies, when you hit those two crossover tracks there could be thrills, chills and spills. Each little Granny keeps her sprightliness with four AA batteries, zipping around the 25.5-inch-wide track until it's time to go back to the nursing home. 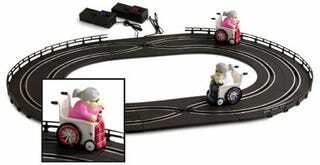 To heck with those streamlined slot cars—we want the grannies! The set will set you back $19.95.